with a sporting activity for a good cause. Place: Where? Palexpo – Parc Sarasin | Please visit the Charity Run/Walk Desk in the registration area to receive all the race details. Advance registration is now included in the online registration for the congress. We recommend you register online to easily collect your race-number on-site at the “Charity Run/Walk” desk. On-site registration will be possible as well at the registration counters. Contact the “Charity Run/Walk” desk for all information regarding the race. 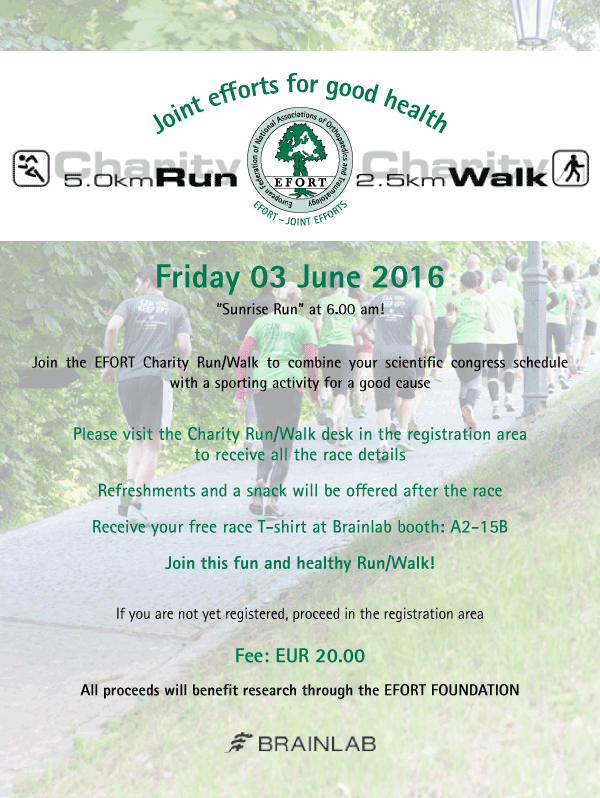 Charity: 100% of the race proceeds will support the EFORT Foundation – to promote science and research and to improve the level of orthopaedic and traumatological care throughout Europe by supporting knowledge exchange and training. Refreshments and a snack will be offered after the race! Join us in Geneva for this fun and healthy Run/Walk!